I can remember taking the CPA and waiting for what seemed like forever to find out if I passed or not. Back in the day, NASBA didn’t have targeted release dates or an online system where you could just login to check your status. You were stuck waiting for a letter to come in the mail or to be sent to your inbox. It left you questioning whether you did well enough on the simulations and multiple choice to avoid the dreaded 74. Or worse, questioning why you wanted to become a CPA in first place. Needless to say, it was pretty awful. Today the AICPA and NASBA have really organized their approach to releasing CPA test scores. Now they release the result in waves depending on the date that your took your exam. This is a great system because you don’t have to wait until the end of the testing window to find out your results if you took in first thing. As soon as you take your exam, the results are set out for processing and you should hear back from them in a matter of weeks. I know it’s a horrible process to wait for your results no matter how short the wait is, but at least now there are approximate dates you can look forward to. Below are the 2016 CPA exam score release dates for the first and second quarter testing windows. As you can see, the first column is your testing date and the second and third columns are the dates when the AICPA receives your testing data and releases your advisory score. One thing to keep in mind about the release dates is that the AICPA usually gets all of your testing data from the Prometric testing center within 24 hours of your exam, so the vast major of candidates will get their data processed on time. If, however, Prometric doesn’t get the AICPA the info before the cutoff, your results will be bumped back to the next release date batch. Also, keep in mind that the BEC test usually takes a little longer to process because of the written sections, so your BEC scores might not be published on the target dates. Still Waiting for Results? Contact Your State. If you haven’t heard anything from the AICPA about your result a few weeks after your target date, you might want to contact your state board and see if the results were issued to them. Some times there are glitches in the system and you aren’t notified before your scores are sent to the designated bodies. It’s super annoying, but it happens. Click below to find your state’s contact information. It’s hard not to go nuts waiting for your results, but try your best. I checked to see if my results came in every single day after my testing date. Don’t do that. Ha Ha. Just keep calm and try not to think about it especially if you are studying for the next section. Worrying about your last section won’t help you pass the next one. If you need some study tips and ways to stay focused, download my free CPA exam cheat sheet. I have tons of great tips in there. 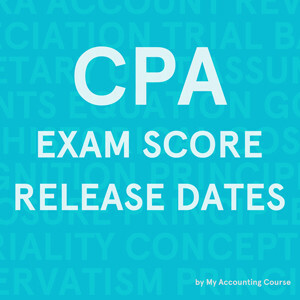 Download my FREE CPA Exam Cheat Sheet! 1 Still Waiting for Results? Contact Your State.